This is a 2 LED flashing circuit. It is based on an analog flip flop circuit. 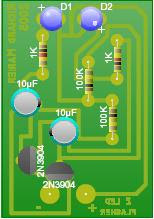 This particular circuit was calculated to use blue or white 3V LED with a 12V power supply. If you are using red green or yellow LED, replace the 1K resistors for a 2.2K. This circuit will flash the led at a 1 sec interval in alternance. For faster or slower flashing speed, you can increase or decrease the 100K resistors.